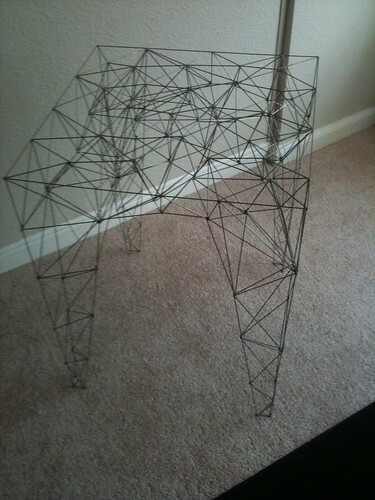 I want to make a dining room table that is reminiscent of a wire frame model (think a computer graphics mesh). I decided to start small and make this side table. From this small version I learned that I should use copper clad welding rod instead of stainless (because even though they make stainless solder and flux, it is not as strong or easy to use as normal solder). Also the table used way more welding rod than I thought. So for a full size dining room table I will probably need 20-40 lbs of welding rod. I also plan to put a frosted glass top on it.